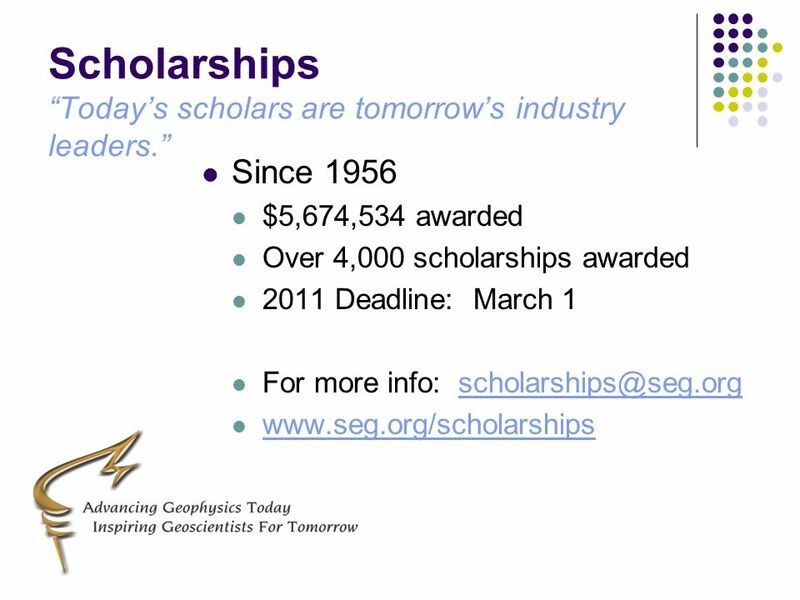 Society of Exploration Geophysicists University and Student Programs Melissa Brown, Univ. & Stud. 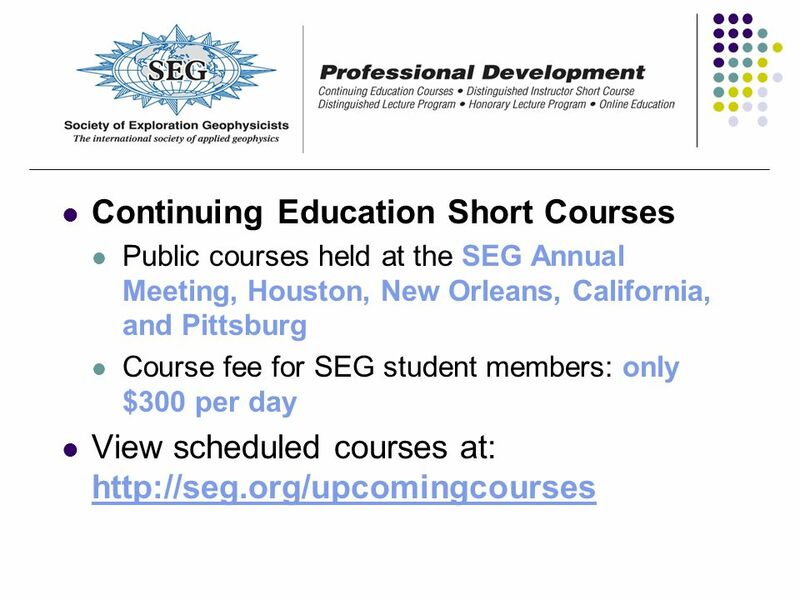 Programs Specialist Univ. 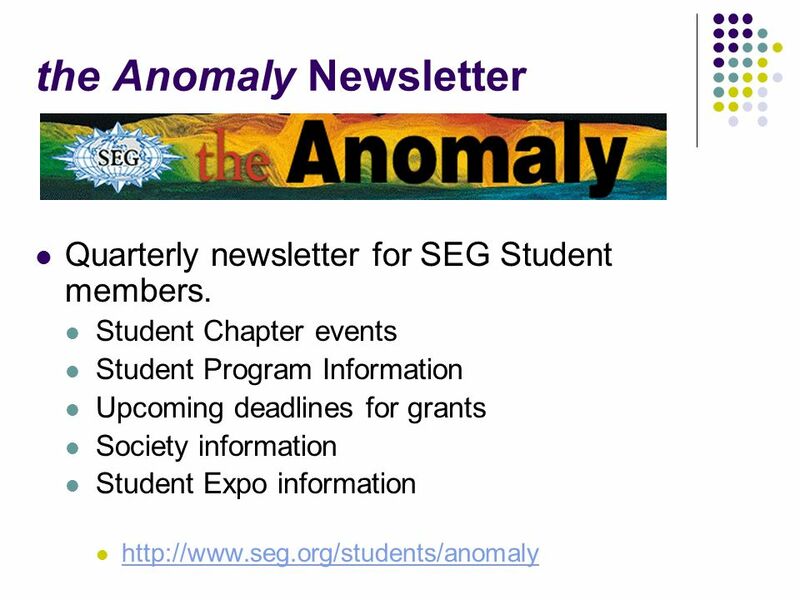 2 YOUR Student Resources FREE Student Membership Student Chapters Scholarships Continuing Education and DISC Courses Distinguished and Honorary Lecturers Annual Meeting Travel Grants Student Expos Student Chapter Book Program SEG/Chevron Student Leadership Symposium SEG/ExxonMobil Student Education Program Geoscientists without Borders Projects of Special Merit & Field Camps Challenge Bowl the Anomaly Newsletter Career Placement Area NEW!! 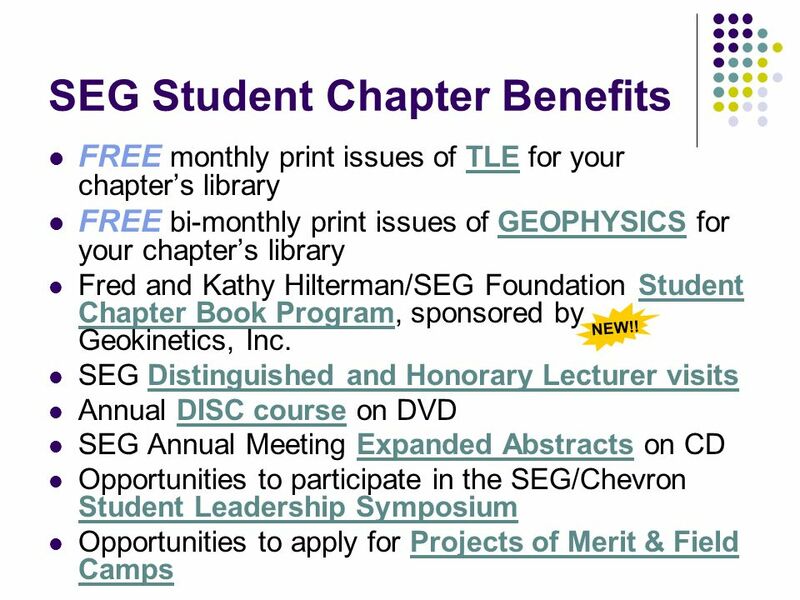 5 SEG Student Chapter Benefits FREE monthly print issues of TLE for your chapters library FREE bi-monthly print issues of GEOPHYSICS for your chapters library Fred and Kathy Hilterman/SEG Foundation Student Chapter Book Program, sponsored by Geokinetics, Inc. SEG Distinguished and Honorary Lecturer visits Annual DISC course on DVD SEG Annual Meeting Expanded Abstracts on CD Opportunities to participate in the SEG/Chevron Student Leadership Symposium Opportunities to apply for Projects of Merit & Field Camps NEW!! 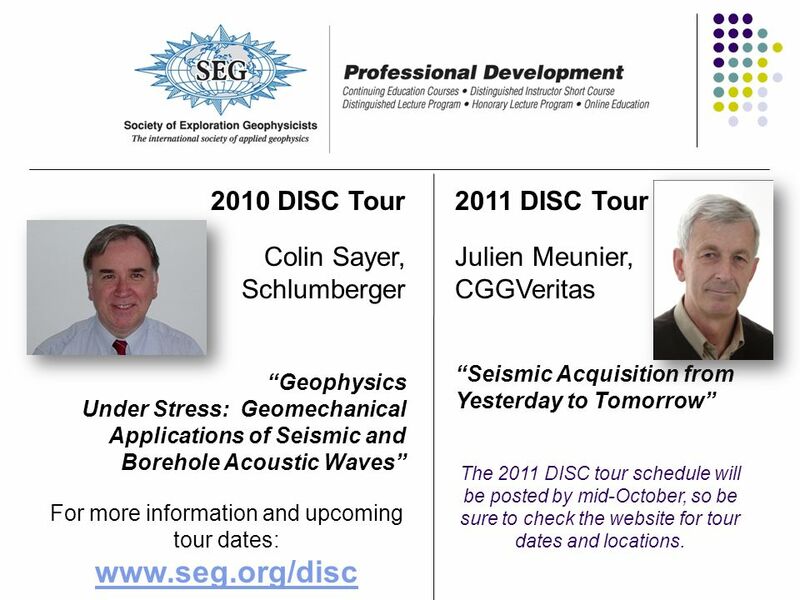 11 2010 DISC Tour Colin Sayer, Schlumberger Geophysics Under Stress: Geomechanical Applications of Seismic and Borehole Acoustic Waves For more information and upcoming tour dates: www.seg.org/disc www.seg.org/disc 2011 DISC Tour Julien Meunier, CGGVeritas Seismic Acquisition from Yesterday to Tomorrow The 2011 DISC tour schedule will be posted by mid-October, so be sure to check the website for tour dates and locations. 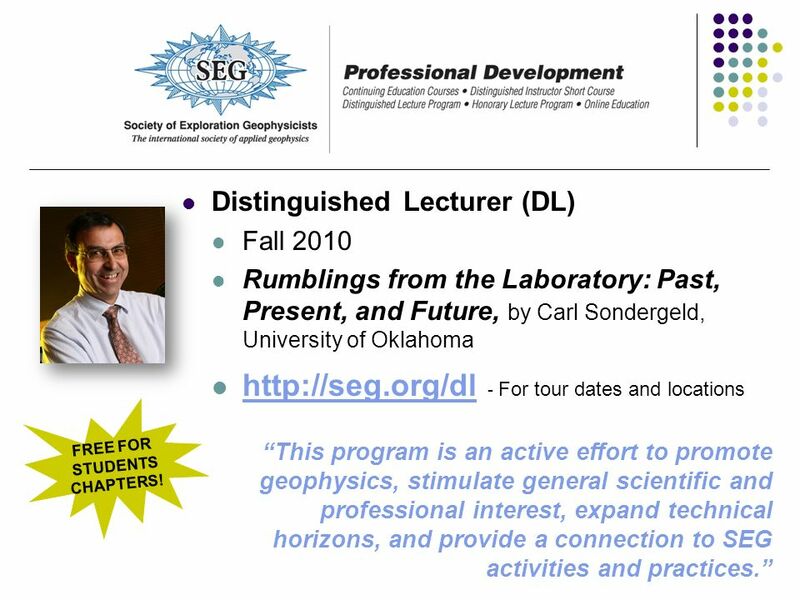 12 Distinguished Lecturer (DL) Fall 2010 Rumblings from the Laboratory: Past, Present, and Future, by Carl Sondergeld, University of Oklahoma http://seg.org/dl - For tour dates and locations http://seg.org/dl FREE FOR STUDENTS CHAPTERS! 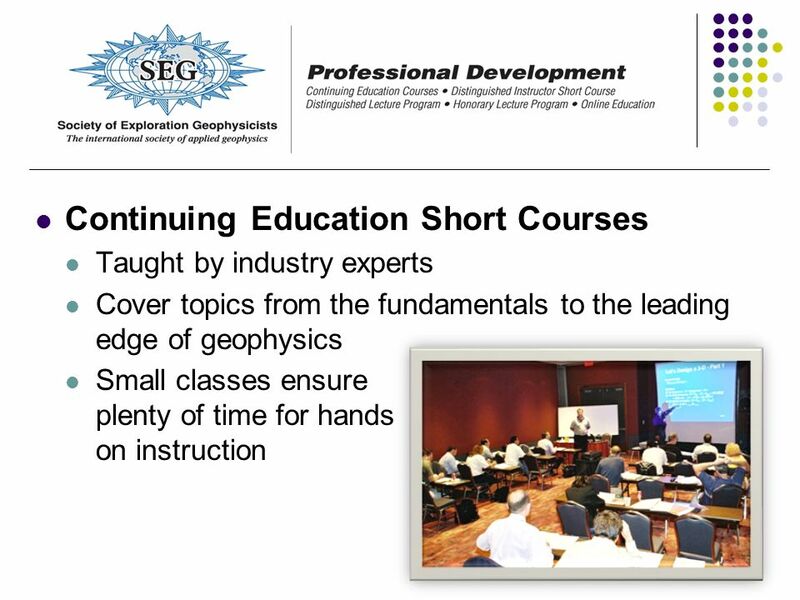 This program is an active effort to promote geophysics, stimulate general scientific and professional interest, expand technical horizons, and provide a connection to SEG activities and practices. 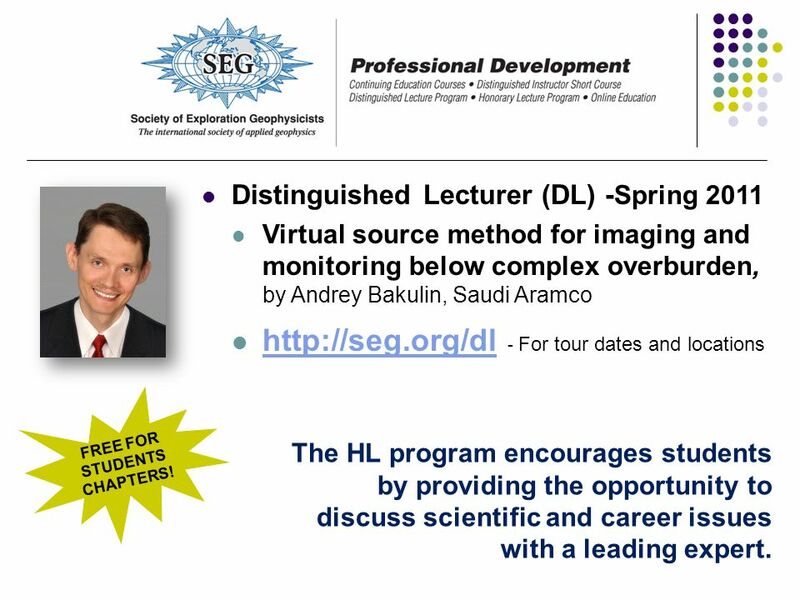 13 Distinguished Lecturer (DL) - Spring 2011 Virtual source method for imaging and monitoring below complex overburden, by Andrey Bakulin, Saudi Aramco http://seg.org/dl - For tour dates and locations http://seg.org/dl FREE FOR STUDENTS CHAPTERS! 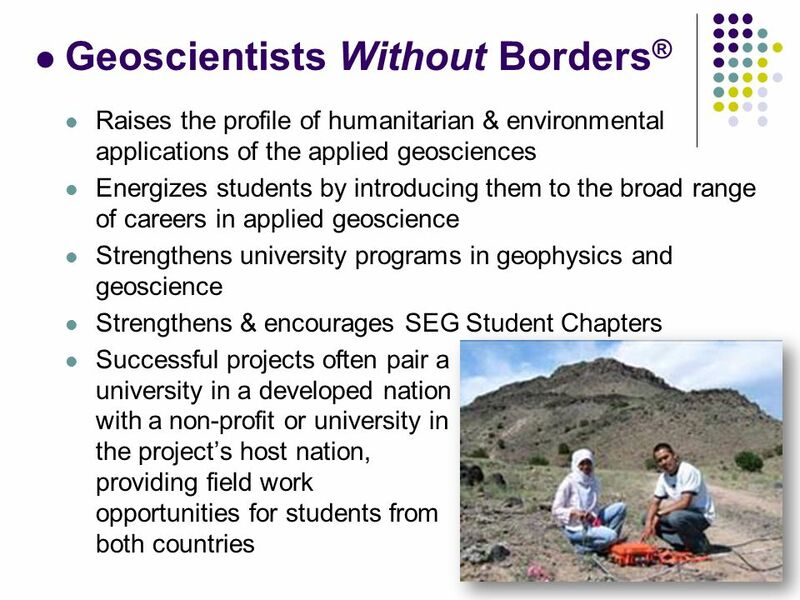 The HL program encourages students by providing the opportunity to discuss scientific and career issues with a leading expert. 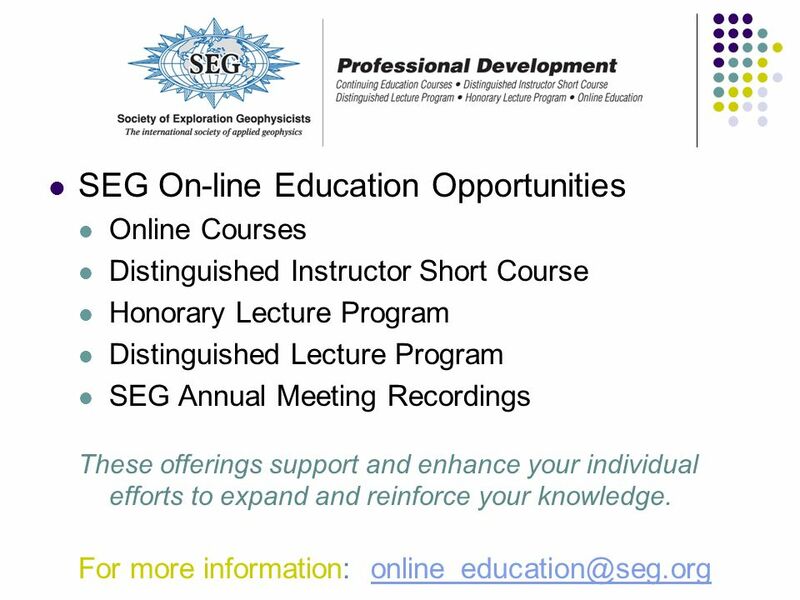 14 Honorary Lecturer Program Central and South America Europe Middle East & South Africa North America Pacific South South & East Asia http://seg.org/hl - For information on lecturers, topics, tours, dates and locations http://seg.org/hl NEW! 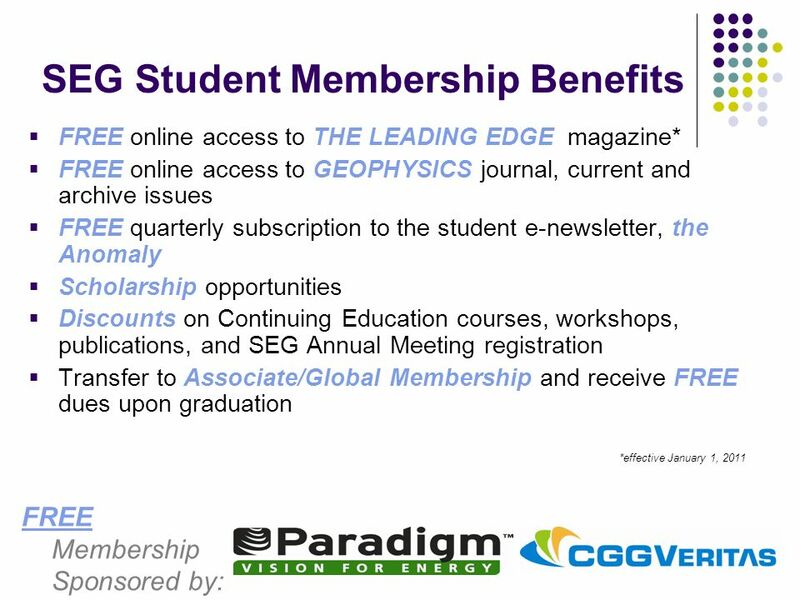 FREE FOR STUDENTS CHAPTERS! 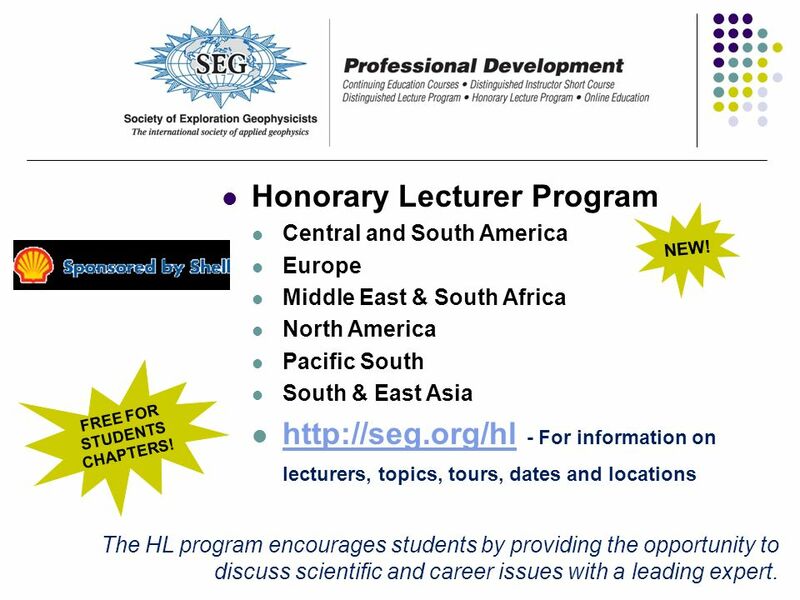 The HL program encourages students by providing the opportunity to discuss scientific and career issues with a leading expert. 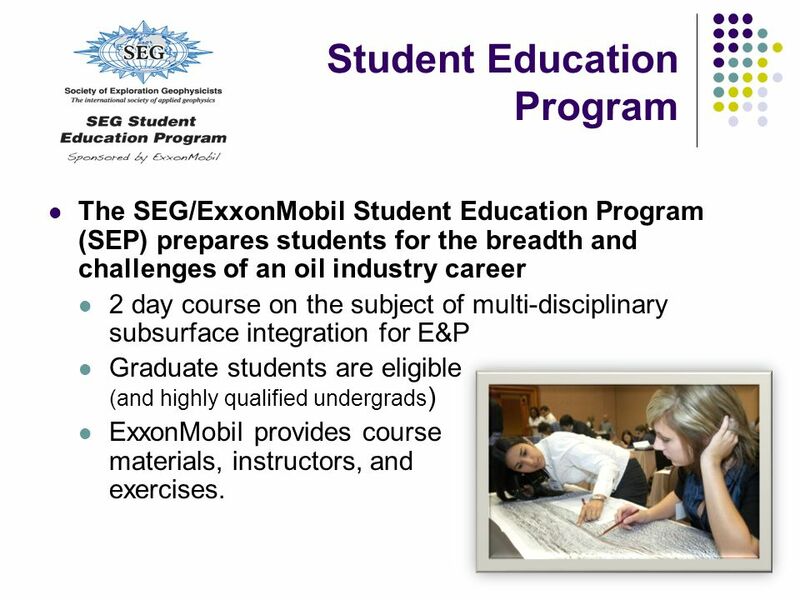 20 Student Education Program The SEG/ExxonMobil Student Education Program (SEP) prepares students for the breadth and challenges of an oil industry career 2 day course on the subject of multi-disciplinary subsurface integration for E&P Graduate students are eligible (and highly qualified undergrads ) ExxonMobil provides course materials, instructors, and team exercises. 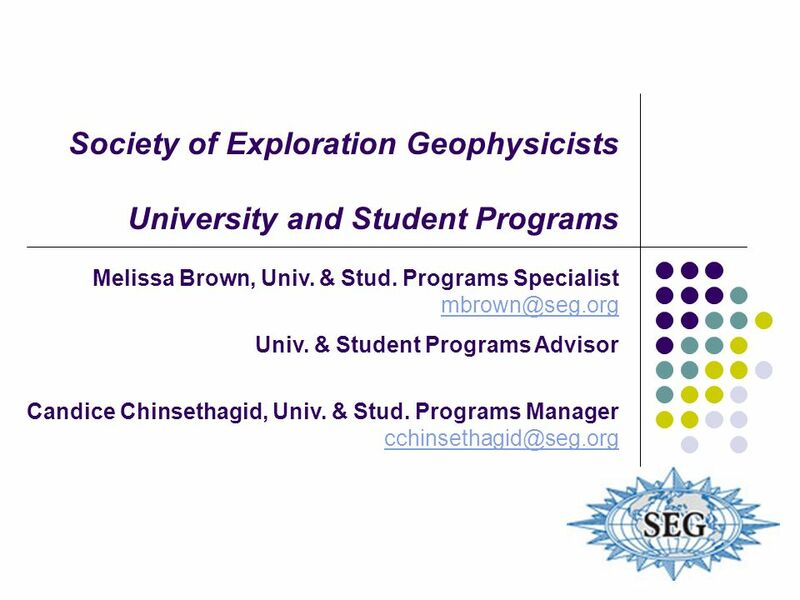 Download ppt "Society of Exploration Geophysicists University and Student Programs Melissa Brown, Univ. & Stud. 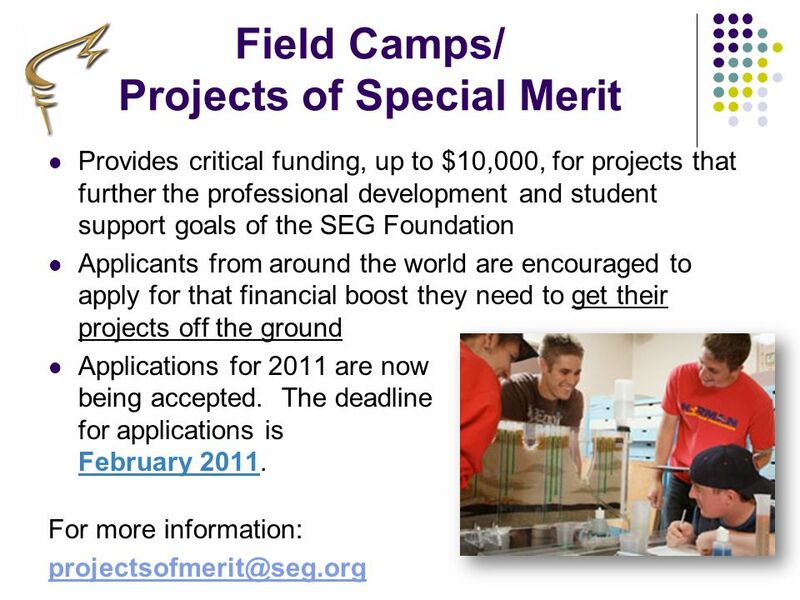 Programs Specialist Univ." 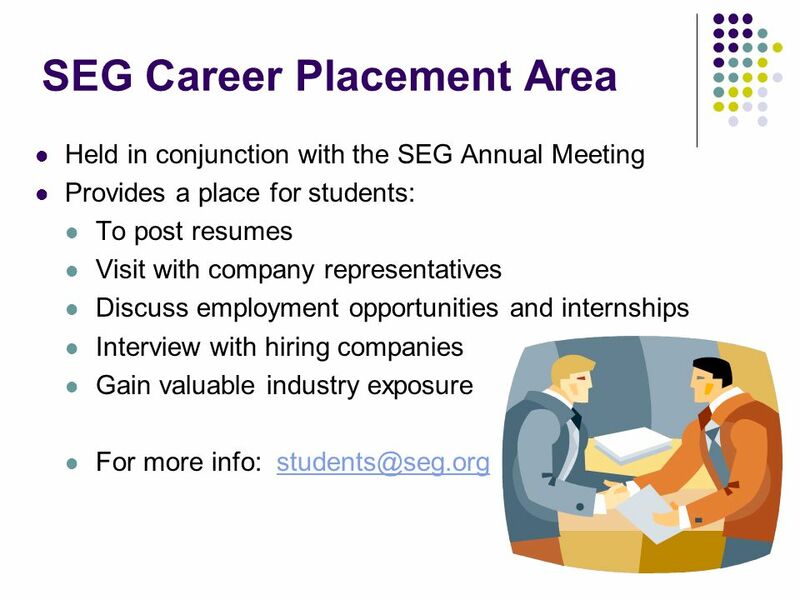 Achieving Greater Satisfaction in Your Neuroscience Nursing Career. 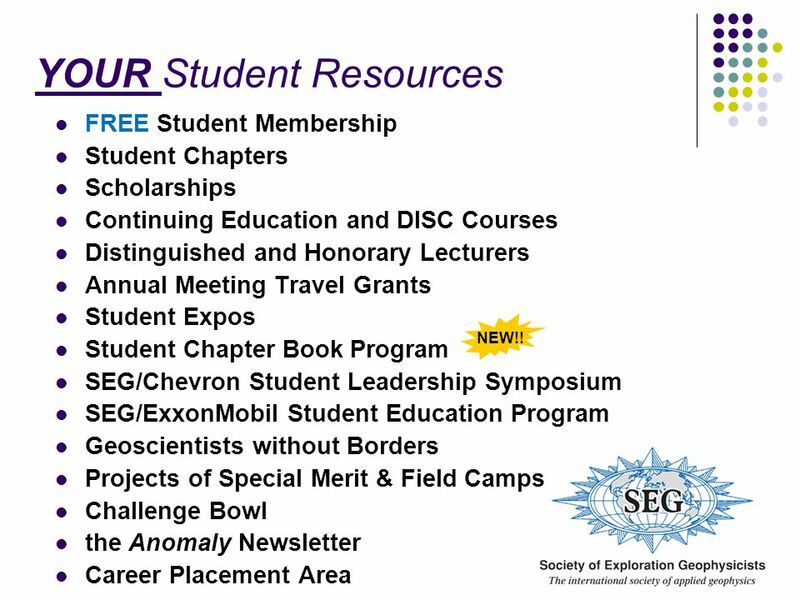 University and Student Programs Division of Responsibilities: Melissa Presson Student Chapters, Student Leadership Symposium, The Anomaly Newsletter, Travel. 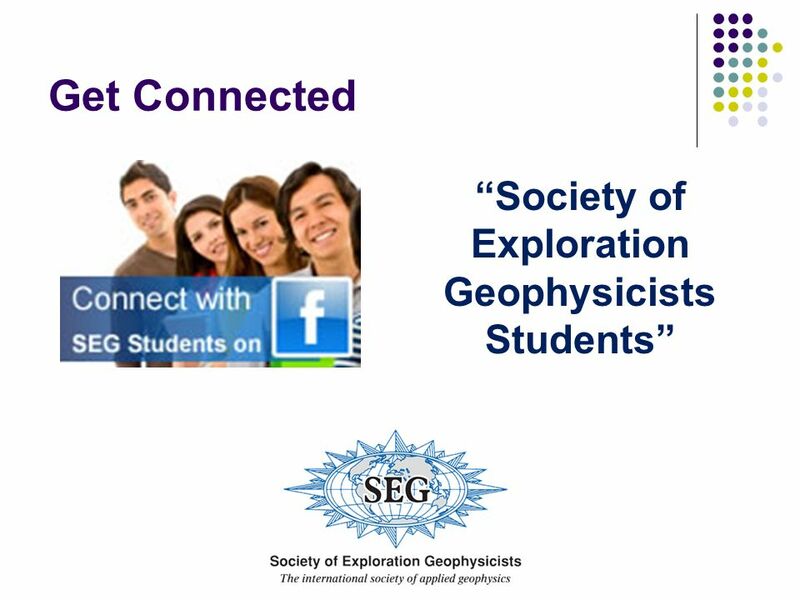 SEG University and Student Programs Support · Networking · Career Building · Fun SEG World Headquarters: Tulsa, Oklahoma U.S.A Tulsa, Oklahoma U.S.A.
Society of Exploration Geophysicists University and Student Programs Melissa Brown, Univ. & Stud. 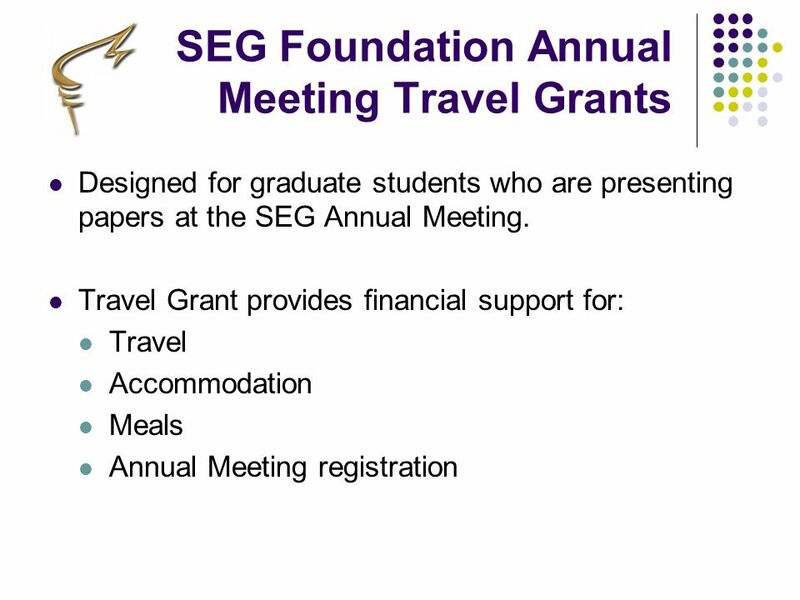 Programs Coordinator Univ. 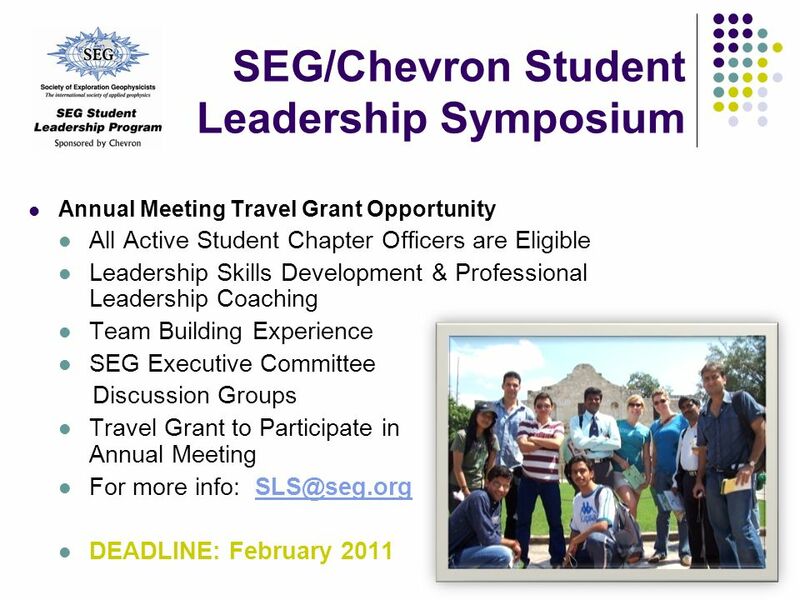 Entrepreneur Support Network (ESN) Thursday Dec Presentation for LEAP. 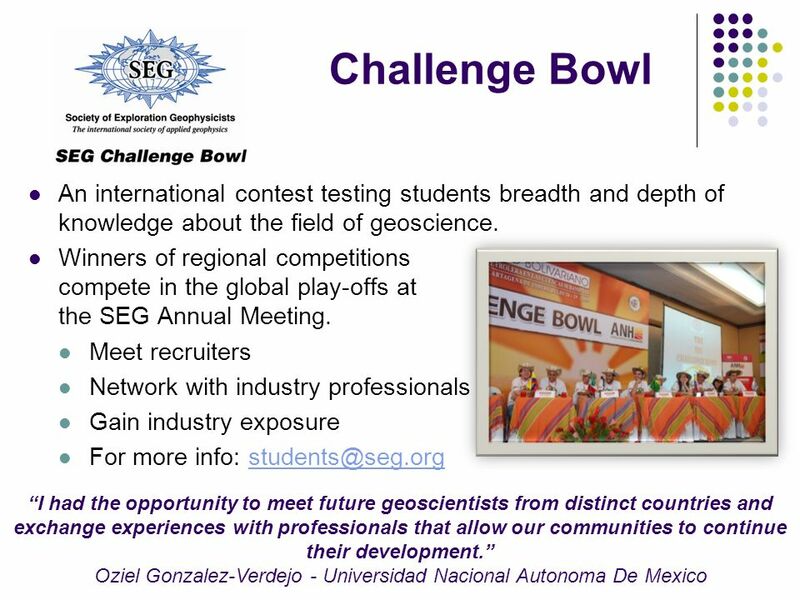 A national program of: Who has the POWER to make your dreams come true? You do! 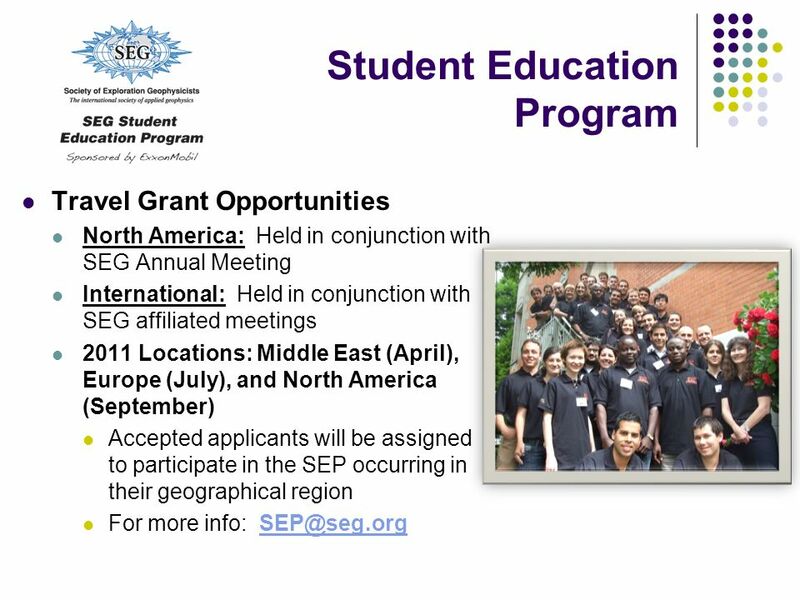 The Student Program for Materials Science and Engineering. 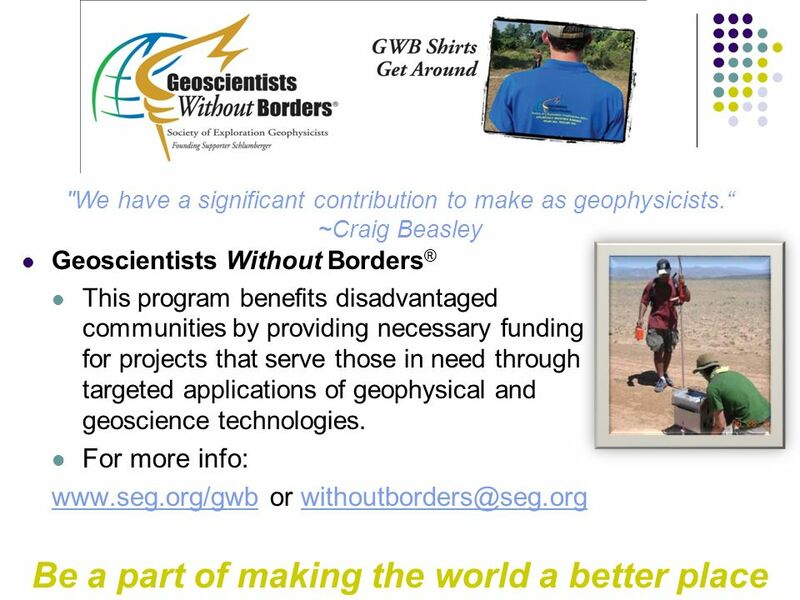 “ All this technology, there must be something we can do.” Craig Beasley, SEG President 2004 “Nothing is so powerful as an idea who’s time has come” Victor. 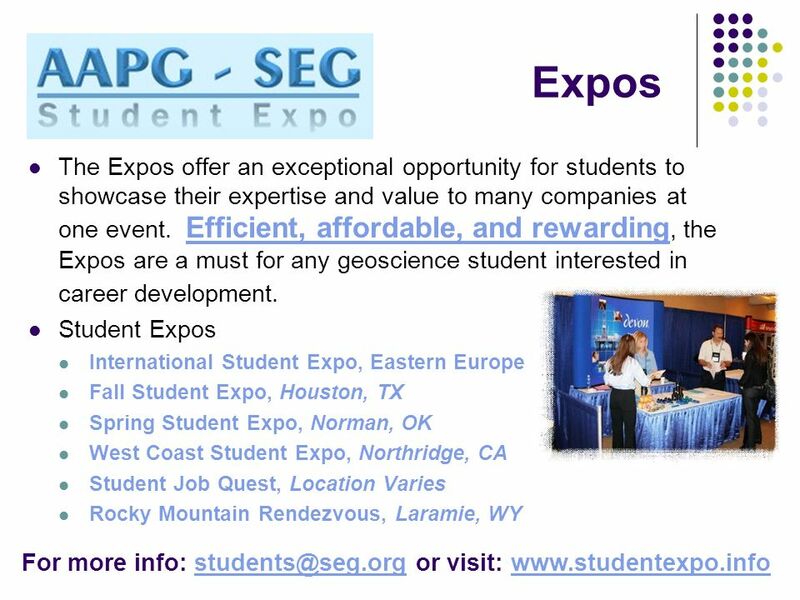 A Non-profit Student Exchange Organization. 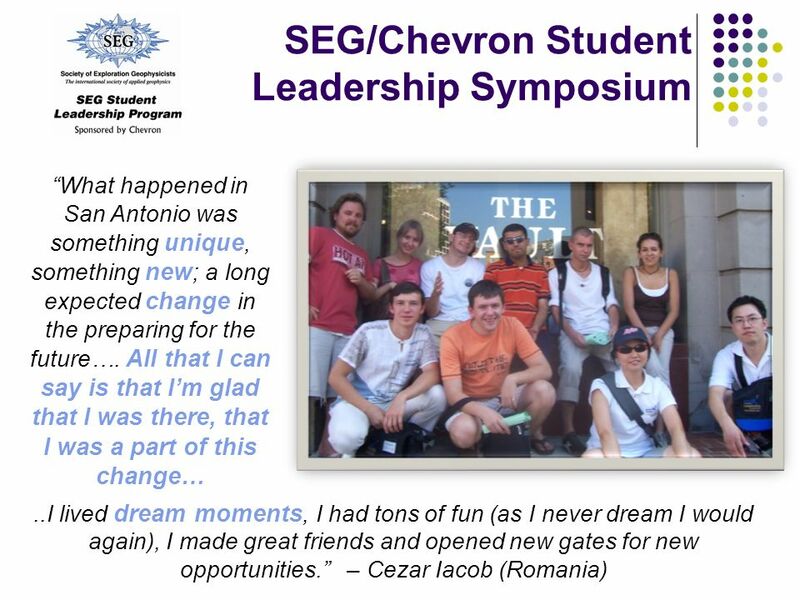 Importance of Youth Exchange “Exchanges can form a foundation of understanding and lasting partnerships, not. 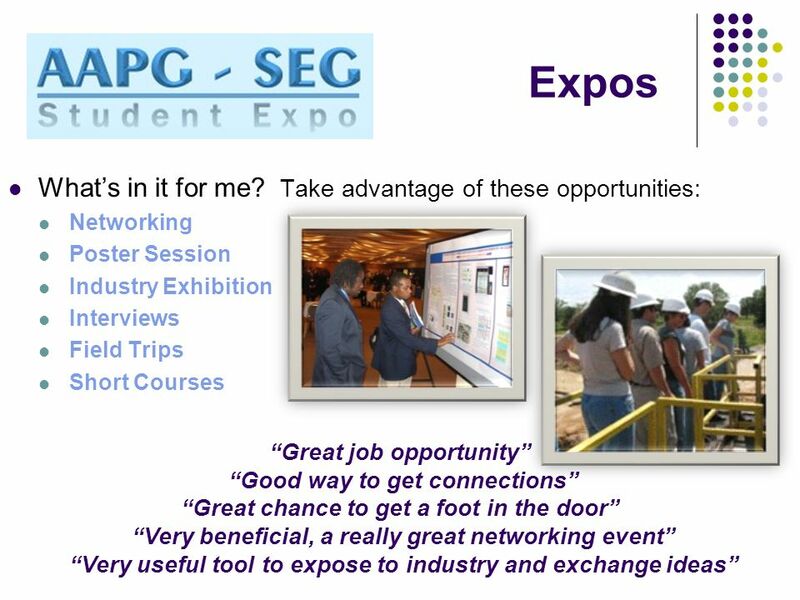 Arts & Science Co-op Physical and Life Sciences Internal Admissions Information Dallas Boyer, Coordinator Co-op Programs in Arts and Science. CalAct Conference March BACKGROUND:  TransTech is the Transportation and Technology Academy of the District of Columbia Public Schools.  The Washington. 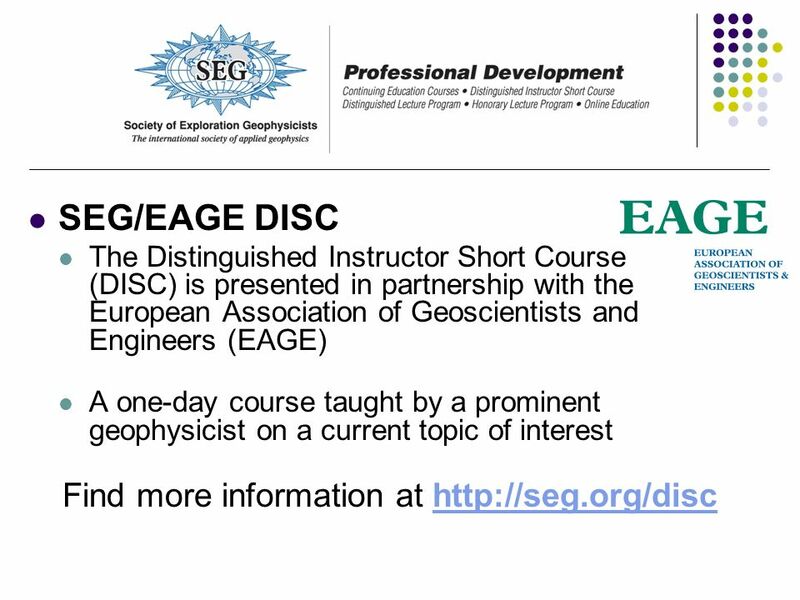 1 It’s for you! 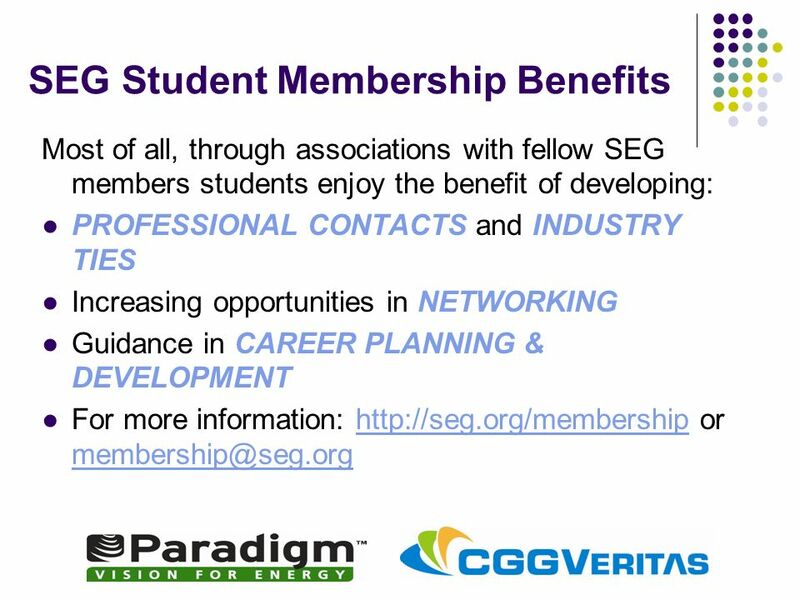 The American Society of Heating, Refrigerating and Air-Conditioning Engineers, Inc.
TAKE ADVANTAGE OF THE BENEFITS OF MEMBERSHIP Advance your career and build your cable knowledge by activating your benefits.